The Power of Power of Brand Alignment Workshop is the centerpiece of the Brand Tool Box Internal Brand Building process. The workshop has been implemented by a wide portfolio of organizations ranging in size from Fortune Global 500 to regional nonprofit organizations. All told more than 50,000 employees from 23 different countries have experienced the Power of Power of Brand Alignment Workshops and developed a stronger alignment with the corporate brand of their employer. Employees can’t be told to live the brand — it just doesn’t work that way. At the core of every strong brand is an organization that is engaged and passionate about the way it makes a difference for its customers. Strong brands and sustainable customer loyalty start inside the organization and are fueled with an engaged team of employees. Internal brand building is all about engaging employees on their terms about how they make a difference for customers and other team members. The Brand Tool Box Power of Brand Alignment Workshop employs the innovative concepts of personal brand based upon the best-selling book Be Your Own Brand. The workshop is proven to engage employees through an innovative training experience that helps individuals discover alignment between their personal brand and the brand of the organization. The Brand Tool Box Power of Brand Alignment Workshop has proven to be a positive learning and personal development experience for employees of all levels and demographics. The learning model to discover the level of employee/organization alignment is known as the Brand Tool Box Power of Brand Alignment. The report from the Broadview Personal Brand Assessment will provide the participant with a reliable, unbiased, factual understanding of how others perceive them. The report also contains a set of analytical tools enabling each participant to analyze the data received and determine their strengths as perceived by others. The next assignment in this module is to determine the gap between the individual’s self-perceived strengths and how others perceive them. Each attendee will compare their perceived strengths with their Personal Brand Platform to determine their Personal Brand Perception Gap and opportunities. As a part of the program customization process a Broadview consultant will work with the client team to “translate” its purpose, values and distinctive qualities into a practical business brand framework, known as the Brand Tool Box Business Brand learning model. The Brand Tool Box Business Brand model has been used for more than 20 years to translate the principle elements of an organization’s or team’s brand into a set of behavior-related descriptors that enable leaders to guide their decisions and actions to reinforce the organization’s promise made to customers. The learning model to discover the level of employee/organization alignment is known as the Brand Tool Box Power of Brand Alignment. 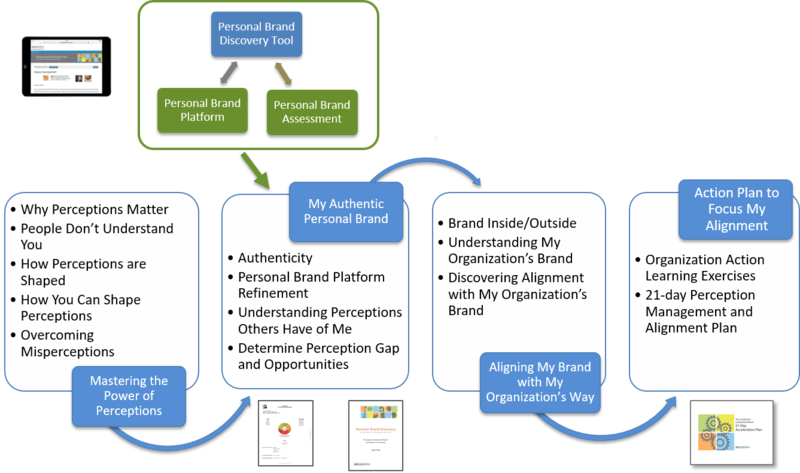 Individuals will quickly discover the alignment strength by comparing the dimensions of their authentic Personal Brand with the dimensions of the organization’s Business Brand model. The strength of the Power of Brand Alignment model is its use of congruent learning brand models that enable the participants to clearly identify the specific areas where her/his strengths are in alignment with the organization’s brand. Employees of all levels will be provided the practical knowledge and tools to leverage their authentic, personal alignment with the team brand. Each employee will leave the program energized and empowered to add to the success of the team brand and to be recognized for his/her contributions. A clear, practical definition of a leader’s authentic strengths. A 21-day action plan to more effectively apply a leader’s strengths to have more impact on the authenticity and power of the “organization’s way” to drive the organization’s success.